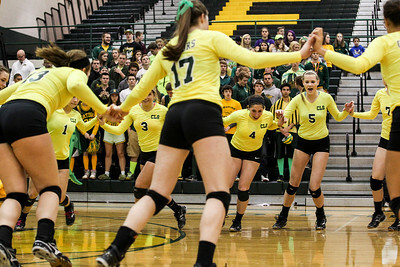 Sarah Nader- snader@shawmedia.com The Crystal Lake South volleyball team warms up before Saturday's Class 4A Fremd Supersectional against Libertyville November 8, 2014. South lost. 1-2. 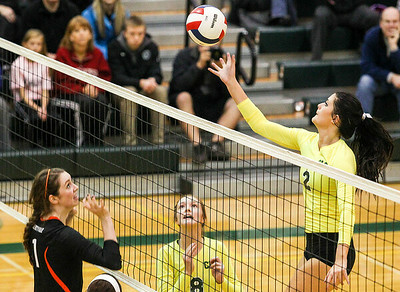 Sarah Nader- snader@shawmedia.com Crystal Lake South's Mary Wille jumps to block a ball during Saturday's Class 4A Fremd Supersectional against Libertyville November 8, 2014. South lost. 1-2. 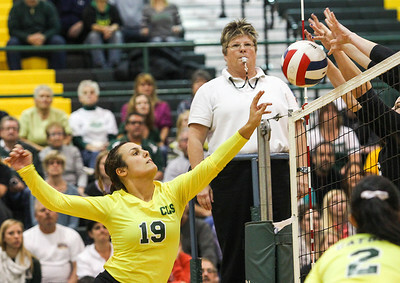 Sarah Nader- snader@shawmedia.com Crystal Lake South's Carly Nolan hits the ball during Saturday's Class 4A Fremd Supersectional against Libertyville November 8, 2014. South lost. 1-2. 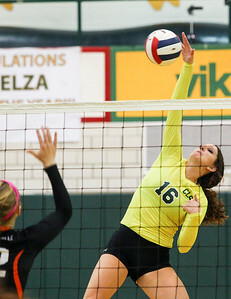 Sarah Nader- snader@shawmedia.com Crystal Lake South's Abby Marchewka hits the ball over during Saturday's Class 4A Fremd Supersectional against Libertyville November 8, 2014. South lost. 1-2. 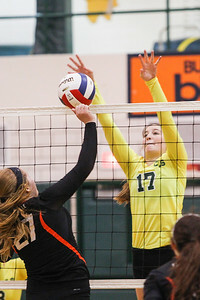 Sarah Nader- snader@shawmedia.com Crystal Lake South's Emma Burkle jumps to block a ball hit by Libertyville's Alex Basler during Saturday's Class 4A Fremd Supersectional November 8, 2014. South lost. 1-2. 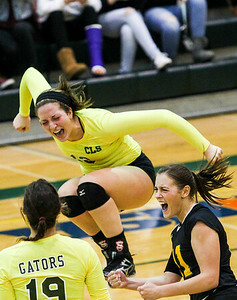 Sarah Nader- snader@shawmedia.com Crystal Lake South's Kendall Kilberger celebrates a point during Saturday's Class 4A Fremd Supersectional against Libertyville November 8, 2014. South lost. 1-2. 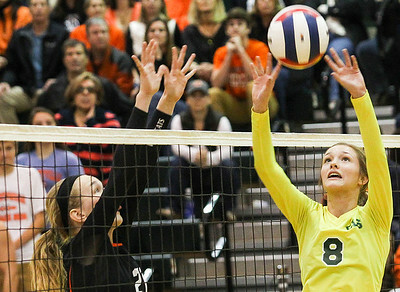 Sarah Nader- snader@shawmedia.com Crystal Lake South's Emma Burkle taps the ball over during Saturday's Class 4A Fremd Supersectional against Libertyville November 8, 2014. South lost. 1-2. 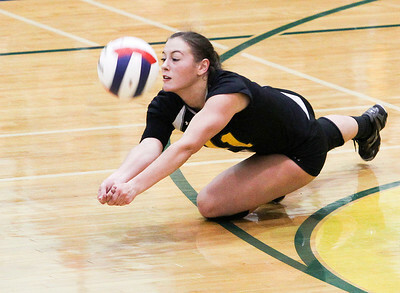 Sarah Nader- snader@shawmedia.com Crystal Lake South's Victoria Falbo dives for the ball during Saturday's Class 4A Fremd Supersectional against Libertyville November 8, 2014. South lost. 1-2. Sarah Nader- snader@shawmedia.com Crystal Lake South's Emma Burkle (left) hugs Kendall Kilberger after losing Saturday's Class 4A Fremd Supersectional against Libertyville November 8, 2014. South lost. 1-2. 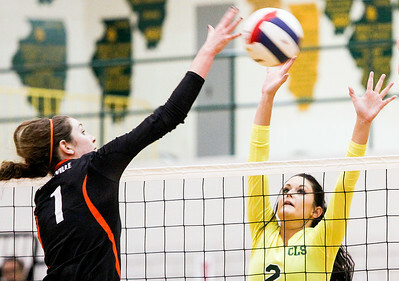 Sarah Nader- snader@shawmedia.com Crystal Lake South's Cassy Sivesind sets the ball during Saturday's Class 4A Fremd Supersectional against Libertyville November 8, 2014. South lost. 1-2. 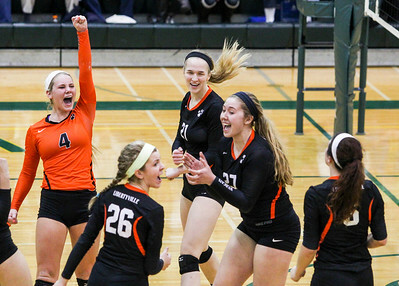 Sarah Nader- snader@shawmedia.com Libertyville's Morgan O'brien (left) celebrates with her teammates after winning Saturday's Class 4A Fremd Supersectional against Crystal Lake South November 8, 2014. South lost. 1-2. 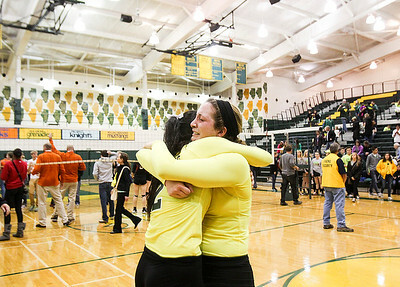 Crystal Lake South's Emma Burkle (left) hugs Kendall Kilberger after losing Saturday's Class 4A Fremd Supersectional against Libertyville November 8, 2014. South lost. 1-2.